Am Strand von Kana'I a Nalu - VRBO-PREISE ab $ 139 / nt! FREE PRIVATE WIFI! Senken Sie die VRBO-Internetpreise. WIR AKZEPTIEREN JETZT PAYPAL! Willkommen in unserem komfortablen, luxuriösen Kana'i a Nalu (sanfte Brandung) im Erdgeschoss im ruhigen Ma'alaea, das oft als "Maui's Best Kept Secret" bezeichnet wird. Befindet sich an einem Ende einer ruhigen Sackgasse und gegenüber einem unberührten und nicht überfüllten, 3 Meilen langen Strand, nur 120 Meter von Ihrer Lanai-Tür entfernt. Der Hafen von Maalaea mit seinen Geschäften, dem Kid Park und dem Maui Aquarium sowie die verschiedenen Touristenboote befinden sich etwa 800 m von der Autobahn entfernt - einen langen Spaziergang oder eine kurze Autofahrt. Unsere Wohnung auf Ma'alaea Bay ist ein wunderschön eingerichtet und dekoriert 2 Schlafzimmer, 2 Bad-Einheit. Haupt Remodel gemacht (2007), die ständigen Updates einschließlich 52 'LCDTV, New Master BR Möbel, Gourmet-Küche komplett mit Granit-Zähler, Kirschbaum Schränke und Designer Geräte. Klimaanlagen, hochwertige Fliesen im Wohnbereich und insgesamt Umbau der beiden Bäder (das Hinzufügen Jaccuzzi Badewanne). Außerdem 32-Zoll-LCD in Master BR, 27-Zoll-LCD in BR2, neuer, sehr leiser Waschtrockner. Plantage Shutters in BRs, Klappladen im Wohnbereich, kostenloses drahtloses High-Speed-Internet. Parkplatz direkt nebenan. Wir haben gerade einen neuen Geschirrspüler und das Hauptschlafzimmer eine neue Matratze ersetzt. Komfortable Erdgeschoss, mit einer großen Meerblick von den Wohn- und Hauptschlafzimmer. Komfortable Schlafplätze für bis zu 6. Klimaanlage, kostenlose Park WiFi und kostenlose Fern USA / INTERNATIONAL. Master-Schlafzimmer-Queen-Bett, 32 'TV, DVD, und Schreibtisch mit Telefon und PRIVATE WIFI, Drucker. 2. Schlafzimmer- Doppelbetten (Kit verwenden, um einen König zu bilden, 27 'TV, DVD, Telefon). Zu Fuß zu Ma'alaea Harbor mit seiner großen Maui Ocean Center Aquarium, Minigolf und Bumper Boat Park, Restaurants und Geschäften. Whale Watching und Schnorcheln fahren von hier. 4 Golfplätze im Umkreis von 5 Meilen - einschließlich Sandelholz, Waikapu, Maui Lani und Elleair (Silversword), mit dem weltberühmten Wailea und Makena Kurse nur ein paar Meilen südlich. Ka'anapali ist nur 20 Minuten nördlich. Wir sind stolz auf unsere Wohnung und würde lieben, Sie haben unser Stück vom Paradies zu teilen. Schlüsselwörter: Eigentumswohnung, 2 Schlafzimmer, Erdgeschoss, Rollstuhlgerecht. We may have stayed for a week that included a very unusual winter storm came down from the Aleutian Islands and brought strong winds, high surf and snow down to below 7,000 ft (and set a record for the island) but we had a super time on a delightful island. The property was just as described. We separated the two beds in Bedroom 2 to make twin beds instead of a king bed as that suited the family better. Well equipped for both household activities and exploring land and water, it was an excellent base for the second part of our holiday after time on Big Island. During the storm, when travel was restricted by very high winds and surface water, the property was an excellent base to simply relax with an occasional trip outside to see what was going on and admire the seamanship of the crews of the yachts taking shelter just offshore. The various printed instructions around the property ensured that we understood how things worked and what not to do. We did drive up the mountain as far as the Park authorities would let us, with snow and ice stopping us from reaching the top, we enjoyed the sunset and then star watching until the cold got too much. At sea level we had a wonderful whale watching trip with the Pacific Whale Foundation nearby. The property helped make a long planned family reunion a success. Perfect for our family vacation. Steps away from the beach and pool! Everything was easily accessible. My son loved all the beach toys and it was his first time on a boogie board. We went to the beach every morning and evening and cooked out on the grills several nights. Being steps away from the beach and pool were perfect for our family. Although Christmas was a VERY busy time in Maui, we loved the location of this condo. It was definitely in the slower part of Maui. The unit was clean and had everything you needed (and more). One downside is no hot tub by the pool but the ocean beach and pool were maintained and nice. We had a wonderful stay at Kana’i A Nalu in early November. Great location and excellent beach. We stayed at Kana’i A Nalu for a week in early November and had a wonderful time. It is a good location in a very quiet area and the beach is perfect for our morning swim and long walks. Unit #112 is at ground level which makes it very quick and easy to walk to the beach and pool although the ocean view is somewhat limited. The unit is very well equipped, it has everything we needed and then some, and after a couple of days we felt very much at home. We stayed at Kana’i A Nalu many years ago and liked it then and we will definitely try to come back. It is very good value for the money. I was very pleased with our stay, being centrally located we were able to go anywhere in a reasonable amount of time including shopping at Costco or Walmart. I loved the sandy beach to walk on right out front as well as a pool. It was a pleasant place to stay, and I would stay there again! 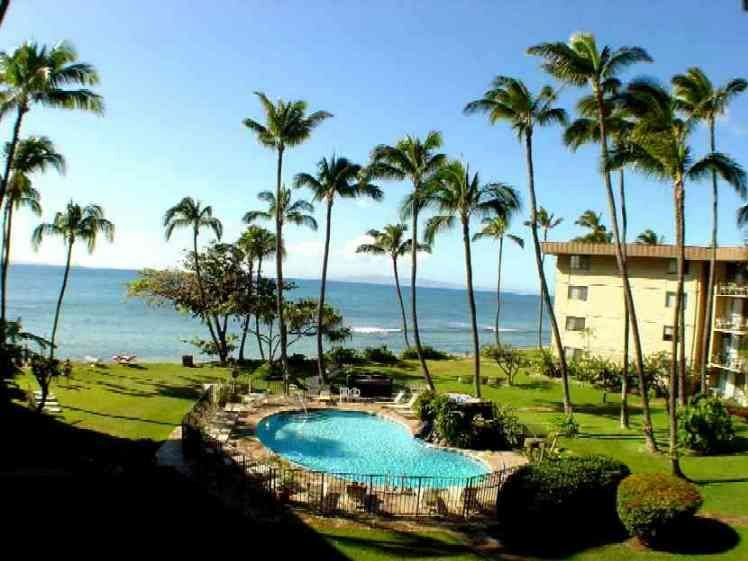 We spent an amazing week at this condo in the Kana'i a Nalu complex in Maalaea which is perfectly located. Anywhere on Maui is an easy drive. This unit is very well appointed and comfortable with an island theme. A beautiful and very functional kitchen,Cable TV and WiFi. Everything you could want is there. We loved being on the ground floor. literally 100 feet from the pool and 200 ft from the beach. We will be back! YOU MUST PAY THE BALANCE OR CANCEL 45 DAYS PRIOR TO YOUR ARRIVAL DATE OR YOU MAY LOSE YOUR SECURITY DEPOSIT (DURING THE CHRISTMAS HOLIDAY PERIOD, WE REQUIRE 60 DAYS CANCELLATION NOTICE). A $50.00 PROCESSING FEE WILL BE DEDUCTED FROM YOUR REFUND FOR CANCELLATIONS. HOLIDAYS REFUNDABLE SECURITY DEPOSIT IS $500.00.